Queens of the photobooth: Luxy and I. On Tuesday I went to the city to catch the collaboration between luxury Scotch whisky Johnnie Walker and iconic photographer Rankin. Johnnie Walker and Rankin are two names that need no introduction to lovers of celebratory scotch whisky and to those in the fashion world (I find there is a quite a bit of an overlap between the two). For the uninitiated, Rankin is a world renowned fashion photographer whose prolific portfolio includes portraits of stars, celebrities, and models alike: Jay-Z, Cara D, Kate Moss, Grace Jones, Mick Jagger, Scarjo and even royalty: Prince William and Her Majesty Queen Elizabeth II. Johnnie Walker are a luxury Scottish whisky whose signature 'walking man' and 'Keep Walking' slogan have graced many a glamourous soiree. I myself am well acquainted with both; having been shot by Rankin in his studio during London Fashion Week, and having attended Johnnie Walker's Malaysian Grand Prix Formula 1 parties in 2012 and 2013. 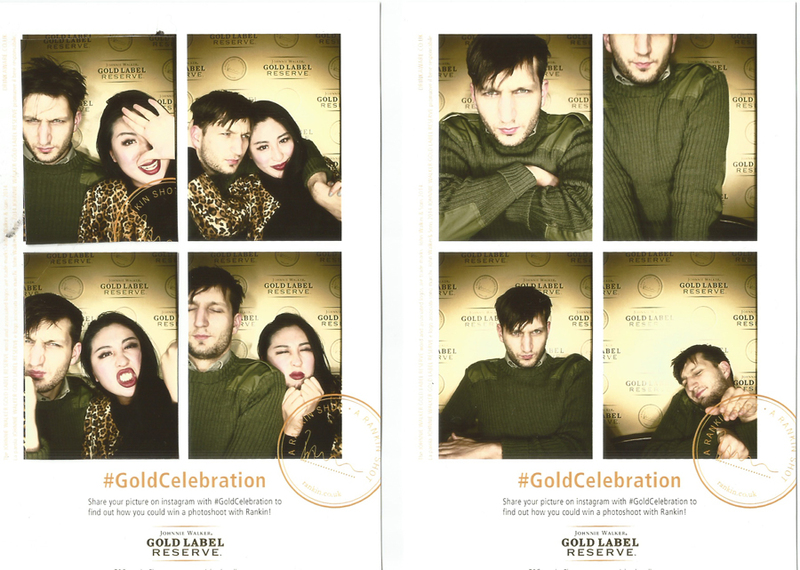 Johnnie Walker and Rankin have collaborated to created the ultimate photobooth in their search for Europe’s new rising star, to appear in an online campaign for Johnnie Walker Gold Label Reserve. 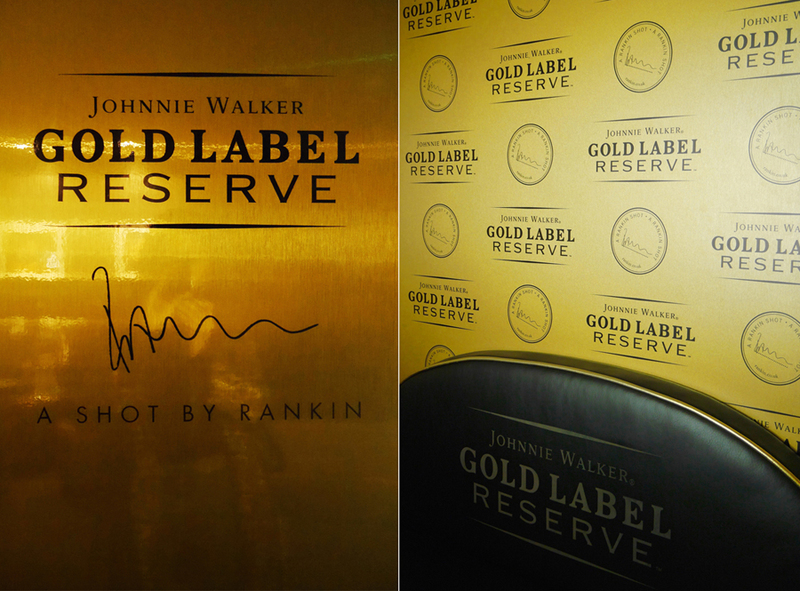 The glorious gold photobooth, designed by Rankin, bears both the Johnnie Walker Gold Label Reserve logo and Rankin's signature. The booth made its debut at the star-studded launch party in Venice during the film festival. 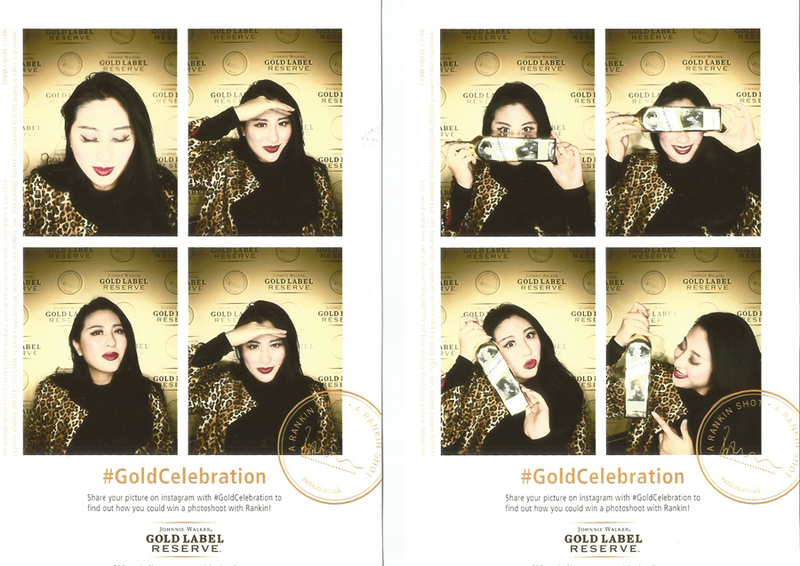 The premise is simple: aspiring beautiful creatures hoping for 'A Shot By Rankin' step into the photobooth, face the almost-impossible-to-look-into golden light (perfect practise for paparazzi flash should they win and are launched into stardom by Rankin), and take four photos of themselves to upload to social media with the tag #GoldCelebration. The five most liked images will be shortlisted before Rankin and his team choose the final winner. The golden ticket, or if you will golden photobooth will be touring Europe and will be appearing in bars, clubs and events across Great Britain till February 2015. 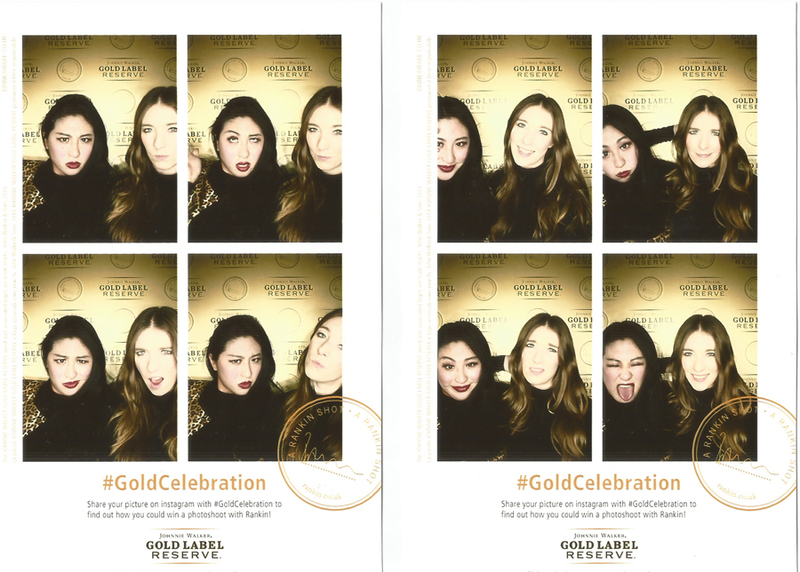 The Johnnie Walker x Rankin photobooth. If that doesn't look like a Golden Ticket (to stardom) then I don't know what does. Henry and I headed down to M Restaurant (where the photobooth will be hosted for the month of December) with journalists and other lifestyle bloggers for an evening of seasonal Johnnie Walker cocktails and for...ahem...networking. And also to have our, fine, my picture taken because you cannot expect a selfie-loving East Asian female to not want to have her photo taken in a booth (hello, Purikura!) especially one designed by a world-renowned fashion photographer. Plus, the photobooth is gold, a fortuitous symbol of prosperity for the Chinese. Huat ah! 祝你羊年财源滚滚，生意兴隆，工作顺利 / Wishing you a goat year with profits pouring in, prosperity in business, and hassle-free work (never too early to start with Chinese New Year wishes!). Toasting to Johnnie Walker Gold Label Reserve with Henry. He picked The Walk Of The Heroes (naturally)--- Gold Label Reserve, a soupçon of orange dry curracao, old spices liqueur, dry flowers, and cloves. Warm, powerful, and spicy, one to light the heart. In the name of research *cough* we followed up with the rest of the cocktail menu. Johnnie Walker Flower for me. Gold Label Reserve, shaken with fresh lemon juice, lifted by the floral notes of elderflower with a dash of egg white. Staying true to the celebratory nature of Johnnie Walker Gold Label Reserve, Henry swirled a glass of Johnnie's Celebration---Gold Label Reserve, dry vermouth, vanilla liqueur, orange and chocolate bitters. A twisted Rob Roy: sweet, smooth, and subtle. 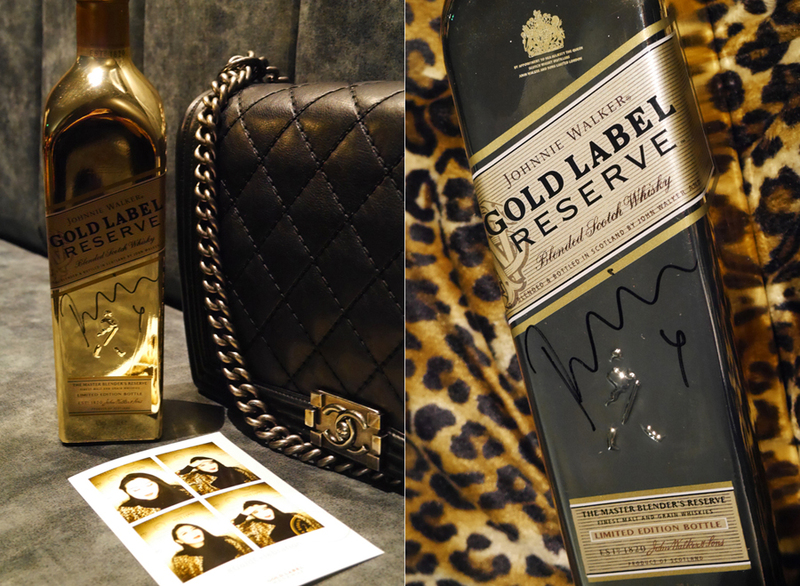 The gorgeous Johnnie Walker Gold Label Reserve bottles, signed by Rankin, complimented my coat ever so nicely. In the photobooth with Londonist writer Janan Jay. We bonded over our shared love of Japanese and we had a cracking time speaking Japanese in excitable schoolgirl voices "Dozo yorushiku! Ahhh! Sugoi ne!" much to the amusement of all present. My first attempt at having my photo taken in the photobooth (and there were many) was not nearly as successful. Left; squint city. Right; Shielding my eyes with product placement. Henry just couldn't handle the glare of the golden light (which makes for excellent glowing skin much like an Instagram filter) but I think that his pained squint adds an intensity to his face. His solo shoot in the Rankin Photo Booth showcases his famous ability to pose like a cat. Meow! ★ Step into the luxury photobooth designed by RANKIN and pose for four glamourous photos. ★ Johnnie Walker will then be in touch with a link to enter. ★ Rankin and his team will take these answers, along with the picture entry to select the final winner.